Paro (Bhutan) – November 22, 2015 (travelindex) – Enjoy your visit, it is our privilege having you here, not only at “the place of peace” but also to the Kingdom of the “thunder dragon”. Visit Bhutan double deal is fully inclusive of the following. – 2 economy return flights on Druk Air (Bangkok-Paro-Bangkok) Departs early am daily. – Upon arrival you will be met by hotel staff and receive your “Khaddar” – traditional silk scarf. – Your luggage, in the meantime is whisked away to your Junior Suite. Village of Paro – shopping for souvenirs or simply enjoying the sights and sounds. – Dinner that evening is a wonderfully prepared traditional feast of local delights. – After a wonderful night’s sleep in your king-sized bed enjoy a late breakfast in the garden. Taking with you a packed lunch and your personal guide. Spa treatments or better still – indulge in a Traditional stone Bath for 2.
complimentary to you and awaiting your usage. Styled and Cooked Meal and spend some time being a “local”. – Then it’s back to the hotel for a nite-cap before a leisurely rest. – Start your day off with a full buffet breakfast in one of our restaurants. – Enjoy light refreshments during the tour in one of our fine Bistros in the town. Tea Room/Library of the Hotel. visit our green house and vegetable gardens. imported coffee in our Coffee & Cocktail Bar. dine – just the 2 of you – amongst the treasures of the hotel on our 1st floor. Your personal driver and guide will ensure that you along with your luggage arrive safely at the airport for your 10am flight home. 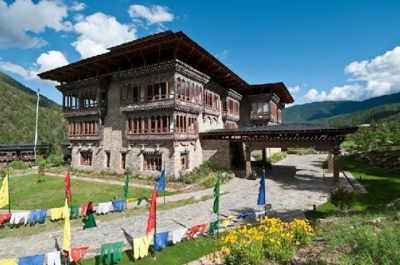 Visit Bhutan Double Deal Fully Inclusive is only US$ 3,001 fully inclusive of all teh above for two persons.